I started an amazing contemporary YA novel on Saturday evening. I read about sixty pages before heading out for dinner with friends. On Sunday morning I woke up early feeling not so great. I couldn’t fall back to sleep so I picked up the book, thinking I’d read a few pages before dozing off. And then I proceeded to read it in its entirety, in one sitting. I never do this… I have a husband and a child and two dogs, a house to keep clean, laundry to fold, meals to cook. Then there’s writing and revising and blogging and emails. I normally only find time to read fifty or so published pages in the course of a day. And that’s a good day. But this book. I just couldn’t put it down. It was compelling and gorgeous and emotional and romantic and even at this early point in the year, I feel confident in claiming that this amazing story will be one of my very favorite 2013 releases. When I read the final page I just wanted more, which is both the best and worst readerly feeling (thank goodness there’s a companion novel coming next year!). Tell me: Have you ever read a book in a day? What’s the last book you just couldn’t put down? I need to read this! Love Gayle Forman. Occasionally, I read a book in a weekend. But a book in one day? I think my eyes would die. Yeah, my eyes were a little fatigued after, but it was so worth it. This book… So, so good, Rebecca! It’s so rare that a book grabs me in this way, and that I have a free day to just devour it. What a treat! Have you read Gayle Forman, Matthew? I’m not sure if her genre is your style, but she is an amazing writer. It is NOT shameful, Nicole! I wish I was a faster reader so I could blow through more books. If you haven’t read JUST ONE DAY yet, you must! THAT being said…I’m a really fast reader. Always have been, but still. ugh. I think I have a pretty idea what book I’ll be reading in the very near future. 🙂 I’m all about the books that can’t be put down. I’m trying to think of the last unputdownable/read in one day book I read was…probably LOLA AND THE BOY NEXT DOOR. I’ve read a number of unputdownable books that I ended up having to put down for one reason or another, though. I think ANNA AND THE FRENCH KISS was the last book I read in a day, actually. Apparently I’m VERY drawn to contemporary find-yourself romance set in European countries. 🙂 Let me know what you think of JUST ONE DAY… I bet you’ll love it! I’ve read a couple of Hermann Hesse books in a single day, and all of Ida Vos’s books, since they’re so short. I don’t think even I could ever pack away a book of 500 pages or more in just a day, though. Oh, I don’t think I could either… My eyes couldn’t handle anything too epically long. 🙂 It’s fun to get sucked into a great book every once in a while, though! I actually have the capacity to read a book in a day – could have definitely done that with THIS IS NOT A TEST and any Kody Keplinger novel, but, like you, there are fifty thousand things to tend to and do and *sigh*. It rarely happens. Also, I must read this book…SOON. I LOVE Gayle Forman! Ohhh you read it in a day? I better read it. I read THIS IS NOT A TEST in one day and THE DUFF (like Alison). Though usually I read a book over the course of three days, so that’s not too quick of a read for me. But still. Thanks for sharing this with me! I usually take three or four days too, Liz, but yeah. I just could not put this one down. I blew through THIS IS NOT A TEST too. Love Courtney Summers! I do this sometimes! It feels luxurious, doesn’t it? I don’t have a kid or a dog, though, haha… Sadly, I haven’t read that many unputtownable books recently–I think the last one was GRAFFITI MOON and that feels like ages ago! It *does* feel luxurious, Cyrstal! I loved GRAFFITI MOON, too. I just read it last month and totally adored it. Why are Australian YA authors always so amazing?! 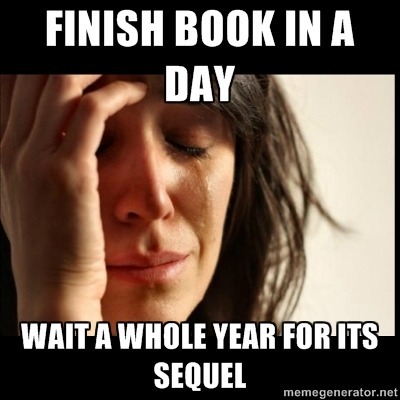 I read a book in a day pretty often over the summer, but it’s harder for me during the school year. I devoured this one in a day, though. I couldn’t put it down! Same, Jess! Gayle Forman has most definitely become one of my very favorite authors. She has yet to let me down with her amazing romances! WHEN YOU REACH ME and JELLICOE ROAD are two of my all-time favorite books, Kat! Did you love them? Now I want to check out THE RULES OF CIVILITY AND WHAT ALICE FORGOT… Thanks for mentioning them!